Del Norte Coast Redwoods State Park includes seven miles of the Pacific shoreline, all very steeply sloping; the land rises up to 1,100 feet just half a mile from the ocean, and is accessible at only one location, via the 2 mile Damnation Creek Trail, one of the best hikes anywhere along the Redwood Coast. 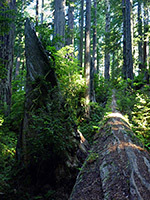 The upper end encounters many huge, old growth redwoods, the serene atmosphere only slightly spoilt by traffic noise from nearby US 101, before the lower part descends steadily through mixed spruce/fir woodland, emerging to a mostly stony beach at the lower end of an overgrown ravine (Damnation Creek). There are many shapely, wave-sculpted rocks along the beach and out to sea, including a photogenic arch, plus numerous tidepools, and the location feels especially secret and remote. Low tide enables walking some distance along the beach, north or south, though otherwise this section of the Pacific shore is entirely hidden - the Coastal Trail stays high above, well out of sight of the ocean, and the next nearest access points are 4 miles north (Enderts Beach) or 4 miles south, around False Klamath Cove on US 101. 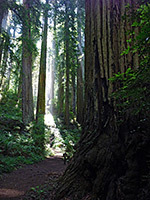 The trail is liable to be partly or completely enveloped by fog, but conditions are often enlivened by shafts of sun, creating pretty, changing patterns of shadows and light. 24 views along the Damnation Creek Trail; gallery, slideshow. The usual place to begin the Damnation Creek hike is from a pullout on the west side of US 101, marked only by an inconspicuous sign at the edge of the forest, near milepost 16. This location is ten miles from Crescent City, towards the south end of the elevated part of the highway, shortly before it descends to sea level at False Klamath Cove. 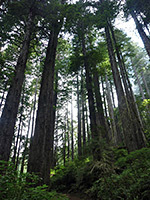 The path climbs slightly then veers north along a ridgetop, staying close to the road, through lush green forest of many large, ancient, healthy redwoods, with ferns, rhododendrons and huckleberry bushes lower down. After a while it descends the far side of the ridge, still within range of the traffic noise, down to a junction with the Coastal Trail; this part used to be a vehicle track - an early alignment of the Coast Road, so the route is wide and level, winding through open woodland of many tall, well separated trees. 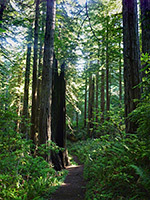 A sign announces 'steep and strenuous, 1.5 miles to the beach', as the Damnation Creek Trail continues westwards, initially with a fairly gently downwards gradient, descending via gentle switchbacks through a forest of more big redwoods, as the sound of traffic finally fades away completely. The woodland canopy opens a little, allowing more light from above, and the first glimpses of the ocean, still quite far below. The trail becomes steeper and rockier towards the lower end, and slippery underfoot due to exposed roots and loose stones, until it reaches a creek, crossing on an aged A-frame bridge, and starts to level out. A longish straight section, and a second bridge, lead to the edge of the forest, and a grassy bluff overlooking the beach, beside a small arch in a little rocky ridge. The shoreline is largely covered by pebbles and boulders, but mixed with patches of coarse sand, and softer sand to the south. Steep cliffs extend in both directions, south towards a distant grassy promontory (Footsteps Rocks), and north along a line of jagged rocks leading to Midway Point. 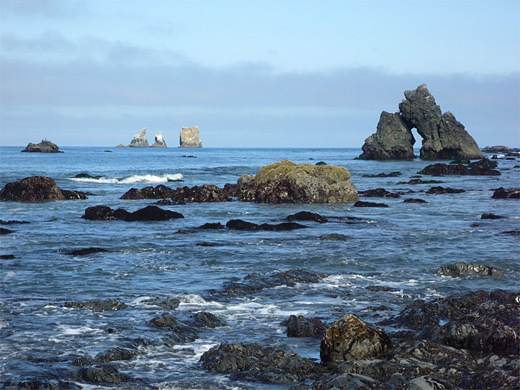 The best element of the scene is a distinctive, isolated arch, 400 feet south, surrounded (at low tide) by many smaller rocks.